Let rise - - take challah - - shape - - let rise again. Bake in a 400 degree oven for 40 minutes for a chewy interior and crispy crust. How many loaves of Challah does this make? It looks like such a great easy recipe! I've been looking for one like this for a long time. Thanks! This will make two very large (whole cookie sheet) braids, or three large, or four medium-sized loaves. I usually make two very large challot with this recipe, and two very large with a "regular" recipe. That way I use 5 lb. of flour and can make a bracha, and we can open one of each type (Yekkish and regular) for both dinner and lunch. There are seven of us, and we have a lot of people on Shabbat. That's great. Thanks again for the information. I'm going to try this recipe. Please post when you do, and let me know how it turns out. There are so many challah recipes, I'd need a lifetime of Fridays to cook them all. I love that you added a picture of the loaves because it makes it even more appetizing. I've been making this recipe for at least a year now and really like it. 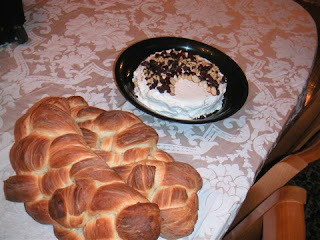 It's one of the better water challah recipe's I've tried. I've been using this recipe for over a year now. I love it. I've found that its still fresh tasting by Shelosh Seudos. Thanks for a vegan challah recipe. My daughter attends a Jewish preschool and sometimes they provide egg-free challah for her, but we didn't know how to make it at home. Hoping to get a response before Shabbat! lovely, I can almost smell them!